Bogo, another WordPress multi language plugin. A multi language plugin, Bogo. The author is Takayuki Miyoshi, the author of the Contact Form 7. The name Bogo comes from a Japanese word 母語, which means mother tongue. 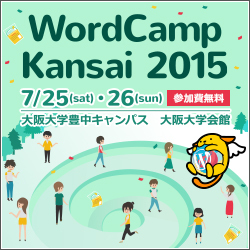 I have used other multi language plugins such as qTranslate and I have tested WPML. WordPress is now translated into many language including Japanese, Thai and all the other languages listed here. 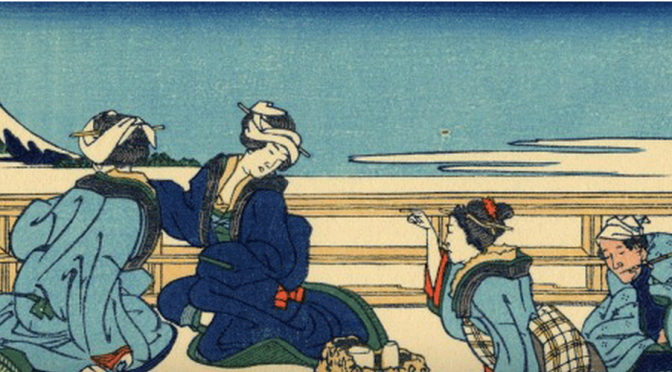 It’s based on the gettext software and the work of localization team in each languages. 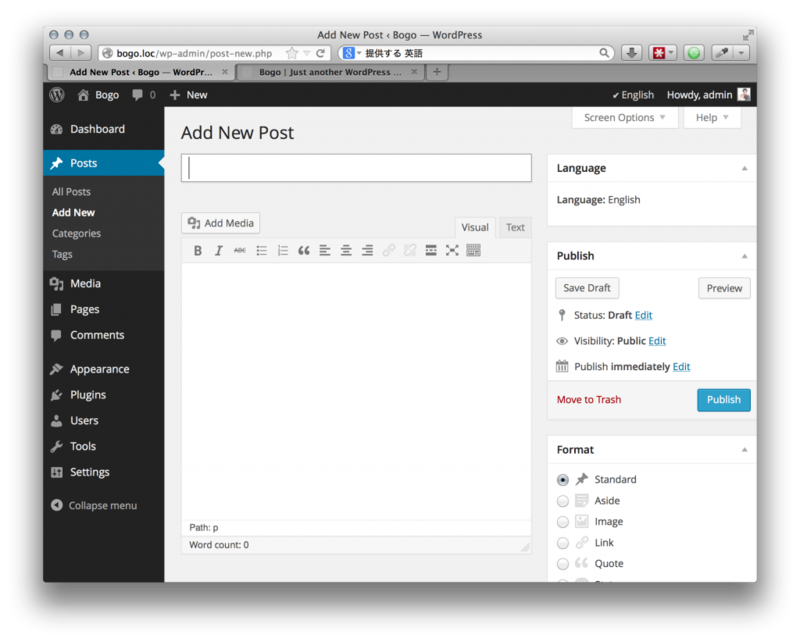 Bogo expands this capability to let you easily build a multilingual blog on a single WordPress install. 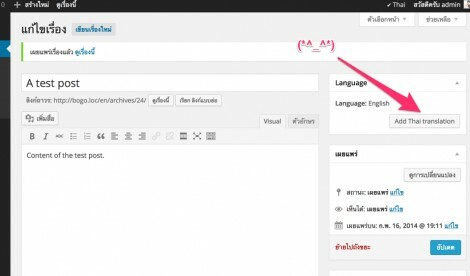 The plugin checks what language files are installed in the WordPress and provides the features below. You will have language switcher menu on the tool bar. Here’s how it looks like when I switch the languages. You will get a new meta box on your post-new.php/post.php pages to make a new post of the existing post. 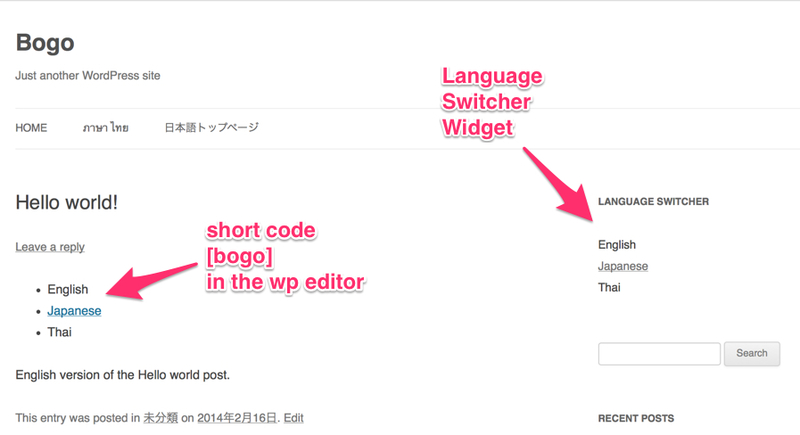 Users can switch languages through clicking links provided by widget and short code. I installed a Japanese version of the WordPress which has define(‘WP_LANG’, ‘ja’); in the config file. When I get rid of the WP_LANG or change it into ‘th’, which means Thai, then the uri loses its /en/ or /th/, and Japanese pages got /ja/ just after the home_url. Custom post types. 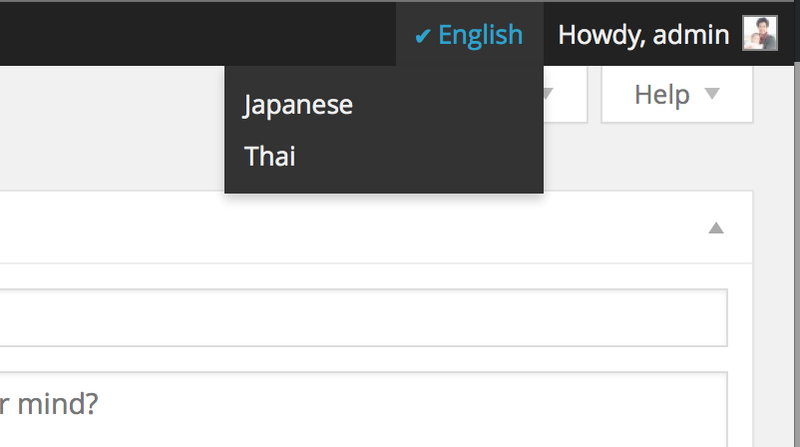 WordPress › Support » Custom Post Types? Categories, tags and other taxonomies, which may come in this spring WordPress › Support » Any way to support categories yet? Duplicating custom fields. I want the custom fields copied too. I will see if there’s any hook to enable this.